What are the different styles of tango and why is it important? For some time I have been intrigued by the different styles of tango as a topic for both understanding but also for how this understanding then has a huge impact on how I dance and teach. When I set topics based around understanding the styles of tango, people often ask why they would want to have this information when they simply want to dance comfortably with a partner and do all the different tango moves available while dancing with the music. For me it’s one and the same. To dance a comfortable dance with all the vocabulary options available is to be aware that each style offers different ‘natural movements’ and ‘unnatural movements’ in the body due to the choice of embrace, way of communicating/ connecting between leader and follower. But also importantly to understand that tango is a dance and music genre that has evolved and been fused with different influences through the years. So what are the different styles of tango and why is it important? Its important for the comfort and effective communication between leader and follower. Music can dictate the style or the style influences the way we interpret the music. Lastly it is a topic misunderstood and full of obscurity due to the lack of documentation about the earlier styles and that while people think they know what style they dance its usually a mixture. I hope to shed some light and at the very least bring the topic into the open for discussion. Below I will go through and briefly explain the various styles in chronological order where possible, the music that has influenced them and the history surrounding them. Canyengue is a dance that preceded tango and has been born, left to history and revived again with what people think was the original style and feel of the dance. Said to have been danced between 1870s- 1920s and contained the original volcada. One big difference between the old canyengue and the revival is that originally canyengue was danced in taverns or the cobble stoned streets of Buenos aires, making smooth elegant movements impossible. Dancers adopted a more jerky hopping style which has been smoothed out in the revised version due to being danced on better floors and by dancers having a smoother stepping technique in their bodies from dancing tango. Most of my sources agree that music of canyengue was 2/4 time and contained the habanera rhythm that gave the dancers a more lilting feeling while dancing. Steps by the women were small and contained due to the fashion of long tight dresses at the time. Dancers used a v shape embrace while sharing an axis, allowing a lot of shared upper body movement. Often danced to music from the old guard like early Francisco Canaro, Roberto firpo and Francisco Lomuto. Roughly in the 1880s Canyengue evolved further into two different recognised styles. Probably more of an evolution than suddenly arriving Orillero (1880’s-today) and Liso (1880’s – 1910’s) styles came to the floor. Tango Liso or smooth tango is said to be an early term for tango de salon and took on the character of small steps due to there being many dancers on the crowded floors of the inner city. In contrast Orillero developed in the outskirts of the city where there were less dancers and so this style took on a form of bigger steps and vocabulary including a lot of playfulness with Rhythmic syncopated quick steps, cortes, quebradas, sequidillas and even jumps. In outward appearance Orillero was more staccato than the smooth Liso style. 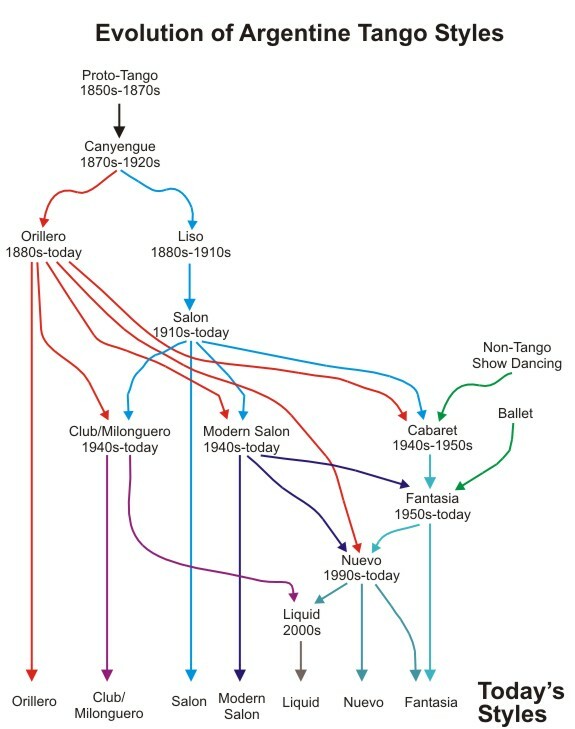 Tango liso became Tango de salon or tango that’s danced in a ballroom (salon). Not to be confused with ballroom tango that could be said to be yet another style of argentine tango but has become more closely related to the other ballroom dances and their own unique philosophy about dance. Salon tango developed around 1910s and is the root for a lot of the modern styles today. Whatever Salon tango was in the beginning it was social, danced in the centre of Buenos aires and danced by the upper classes where Orillero was danced by the poor. It later lead to distinct styles with their own flavour. 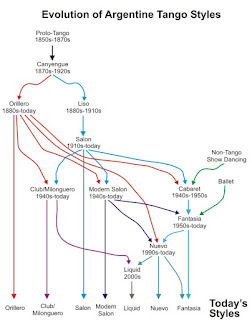 Following the threads salon de tango lead to club style (also known in the 1940s as confiteria style or tango apilado) characterised by the couples appearance of leaning toward each other creating a shared axis, full upper body contact and upper bodies parallel in the embrace. Giving rise to more staccato movements and feet were kept close to the floor. Due to the full body contact dancers couldn’t disassociate in the same way that the contemporary tango de salon dancers could, giving rise to a number of movements that felt more natural for the Club style e.g. cortes, ocho cortado, volcada like movements due to apilado or leaning. Club style later becoming more famously known as milonguero style when people visiting Buenos aires observed the dancers way of moving. Some say it was also an advertising gimmick in the beginning of the 1990s when people used the term to describe the only authentic way to dance tango because this is what the milongueros dance in Buenos aires. The milonguero style has taken on a life of its own with avid followers have even begun to set up special events for those who want to dance with a particular dance floor etiquette including no lifted legs (boleos or ganchos), good line of dance and the use of cortinas and tandas. Which allows for the wonderful phenomenum of the cabaceo, a way of asking someone to dance using eye contact and body language. Another thread from the 1910s-1940s tango de salon is de Villa Urquiza style. Villa urqiza is a barrio or district in the north of Buenos aires and the dance is characterised by a smooth slow elegance and changing distance in the embrace. Some choose for a v-shaped embrace while others remain more or less parallel as the changing distance between the couple allows for a lot of freedom. When danced close it tends to be only the solar plexus contact which allows a lot of torsion which is essential for movements like pivoted giros, sacadas, and a specific range of free leg movements. The third thread coming from the original tango de salon is caberet and later the show styles of tango fantasia and escenario. Styles in their own right and often the first thing none dancers see of tango. With influences from ballet, other sorts of show dancing and the social styles of tango. Show tango in all its forms is often said to not be the real tango and yet it has a strong identity and image in peoples minds as well as many bigger movements filtering down into the social dancing. With any evolution there will always be a Nuevo style or new way, whether really a style by itself or a new outlook on what has been before. It depends on the time and how main stream this Nuevo style becomes. Some say that the term was first coined with Petroleo in the 1940s celebrating choreographic advancement through innovation and investigation into whats possible instead of what has been. Others would more commonly recognise tango Nuevo coming from a group of four men who came together with the idea of systemising tango allowing for a more didactic approach to teaching and learning. Gustavo Naveira, Fabian Salas, Chicho fromboli and Mauricio Castro identified more possibilities of what was already danced through this process allowing greater ability to improvise and brought new names for things already danced, one example of this would be volcadas which can be traced back to the axis sharing canyengue style but also a more recent dancer famous for the apilado (lean) style in which he danced many volcadas if not constantly in volcada, Carlos Gavito. The one big thing that did change from the 1990s with this Nuevo style is that teaching has become higher quality, understanding of tango and what we do as dancers has gone deeper than we have ever gone before and in the last few years people have been bringing the things learnt in this new movement back to the close embrace and traditional music that is so rich and intriguing to dance on. Nuevo usually isn’t lasting in the same way, good traditional music can’t be listened to enough. For many argentines the term doesn’t even exist while many Europeans believe it to be big steps, none traditional tango music inviting open embrace and big extreme vocabulary. So whether you take any one of these three possible explanations of neuvo style I would like to leave you with this last thought. In 1940s Petroleo and his friends created a Nuevo style, in 1960s-1980s piazolla was described as making Nuevo music/neo tango music and in the 1990s Naveira and the others created a new movement with their systemisation of the dance. For me Nuevo style only exists in context with the traditional styles as its more a movement forward from what has been than an actual style of its own. What do you think? Nuevo styles in the future will be different in character but will probably use the same name. In conclusion, one basic division in styles is those for social dancing and those danced during shows. What people understand as milonguero, tango de salon or any of the other styles seem to be blurring, making the general concensus over what these styles are nowadays move further away from what they were originally. Loosing the old dancers who were around in the times we have been discussing through this article means that now more than ever its important to find more clarity on what has been and document it before it leaves us forever. Or maybe, this loss is part of the evolution of tango and the history is carried in our steps. Food for thought. After some years of searching for the new way we have started to look for authenticity of the traditional tango. Check out one of my other dance articles. Make tango history and upload!